Victor Czerkas grew up in Iowa and there learned the sign painting trade. In the 1930s he moved to Southern California where he worked as a sign painter and freelance commercial artist. By the 1950s he was employed by Universal Studios as a lettering artist, producing hand lettered titles for major motion picture releases. In later years he did similar work for ABC Television programs. Throughout his life Czerkas also produced fine art watercolors and oil paintings. He studied art in the 1930s then continued his art education with private painting lessons from Nicolai Fechin. 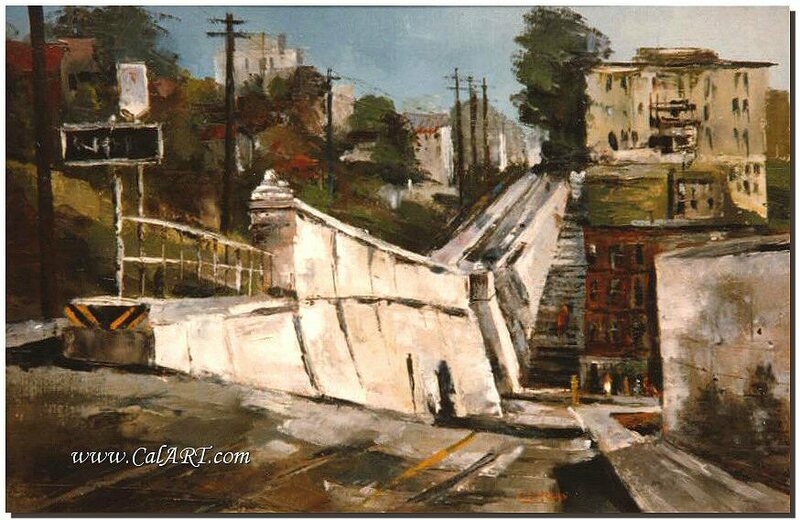 Most of his early paintings depict regional California cityscape and landscape views. These were often produced outdoors on location while viewing the subjects. After 1978 he also produced works depicting subjects he found while traveling in Europe, Russia, India, as well as areas in the Caribbean and Orient. Victor Czerkas biography Courtesy Gordon McClelland, Author "California Watercolors 1850-1970". Bunker Hill Oil on Canvas by Victor Czerkas.